This list is for policy researchers and journalists who have read Helpless and are seeking to explore core issues, lessons, myths, solutions, historical records, etc. MPP Toby Barrett’s historic and shocking document summarizing the Caledonia crisis in a few, short paragraphs. Includes deals made not to prosecute native criminals and a promise to them not to call in the armed forces to protect Caledonians; use of Ontario Provincial Police to target non-natives; illegal peacekeeping mission on Cdn soil & Ipperwash Inquiry policy fraud used to subvert the Charter & Police Services Act and avoid accountability, etc. From Part 2 of Mark Vandermaas presentation to ‘Caledonia: No More Nightmares’ event, Ottawa, March 22/11: Caledonia Myths & Policy Issues. Ontario government petitioned Court not to jail native protesters and offered $200,000 towards legal fees, plus more if an appeal of the convictions is necessary. Contrast this with the Crown’s vigorous prosecution of non-native Gary McHale for what Christie Blatchford called the “bizarre charge” of counselling mischief not committed [LINK]. Source docs re May 30/08 Police Services Act complaint to provincial Minister of Community Safety & Correctional Services setting out evidence supporting allegations of criminal behaviour by Julian Fantino. Minster refused to investigate or even request evidence. Prime Minister Harper’s Attorney General Rob Nicholson was provided a copy of the complaint, along with a request for assistance which he refused. Fantino would eventually be ordered by a Superior Court judge to be charged with Influencing Municipal Official, and his two senior officers, Deputy Commissioner (now Commissioner) Chris Lewis and Superintendent Ron Gentle would be ordered by the Court to face charges of Obstructing Justice for their role in the prosecution of Gary McHale. Two-part series by Mark Vandermaas, Gary McHale and longtime Ipperwash activist Mary-Lou LaPratte was published in Caledonia’s Regional News; explains the policy fraud perpetrated by the Ontario government and OPP use of the Ipperwash Inquiry’s recommendations to ‘justify’ their handling of Caledonia. Both the government and the Opposition know full well the inquiry did not allow the issue of native violence against innocent residents to be studied, which is why the recommendations are of no use to Caledonia’s victims. When this myth is finally exposed Ontario can begin to build a foundation for future healing and reconciliation based on truth instead of lies and misguided recommendations. Key reference: The Ipperwash Papers project. This letter, which was never admitted as evidence to the Ipperwash Inquiry, was written by the Chief Administrative Officer for Bosanquet County on March 13/96 who makes it clear that Dudley George’s death was the result of a failure to enforce the law in the years prior to his death which led to an escalating level of violence and intimidation against non-native residents by emboldend native radicals. Mr. Williams states that town officials had repeatedly warned every level of government about the danger of death or serious injury for two years prior to his death. Caledonia, too, suffered from escalating violence due to the refusal to enforce the law, an escalation which resulted in the near-fatal beating of builder Sam Gualtieri inside a home he was building for his daughter. This chronology of Ipperwash events from the non-native perspective was never published by the Ipperwash Inquiry along with other submissions directed at preventing future violence, and Ms. LaPratte was denied – as were all non-native victims of native lawlessness – the opportunity to testify. Readers cannot help notice the shocking comparisons between Ipperwash and Caledonia. First mainstream media journalist in Ontario outside Caledonia to write about the Ipperwash Papers project and to quote CANACE founders regarding its revelations. The complete story (when reviewed in conjunction with 2 & 3 below) behind the Helpless account of a shocking perversion of police authority and the Canadian justice system by then- OPP Commissioner Julian Fantino who, before the investigation into the Dec 01/07 smokeshack violence had even begun, ordered his officers to target Gary McHale with a criminal charge – and not to “get bogged down with legal nuances” in order to do it. Tells how McHale fought back without a lawyer or formal legal training. When the dust had settled, the charge against him was dropped, two of Fantino’s senior officers were charged with Obstructing Justice, and McHale was two days away from a Superior Court hearing into his application for all emails between the Deputy Minister of Community Safety & Correctional Services and the OPP. Includes links to all source documents, including court transcripts. An in-depth examination of what happened when the resources of the state were brought to bear in order to try to silence a law-abiding citizen whose only crime was to speak out for people who had no one else to speak for them. Small Claims Court statement of claim for defamation vs. former OPP Commissioner Julian Fantino which outlines his complete campaign to smear and discredit Gary McHale and his followers as racist inciters of violence for daring to oppose his force’s racial policing policies. Former OPP Commissioner Julian Fantino’s lawyer Chris Diana recently (Nov 2010) informed the court that (contrary to his earlier public assertions) his client has no evidence that Gary McHale or Mark Vandermaas have used or advocated violence during their opposition to OPP policies during the past 4 years. Mark Vandermaas speech at Caledonia Lions Park, May 24/09. Published in Caledonia Regional News, May 27/09. A legendary Canadian journalist helps readers understand that Caledonia is a civil rights struggle on the world stage as he cites Mark Vandermaas & Gary McHale’s application of Dr. King’s teachings in confronting racial policing. Joint statement by Gary McHale & Mark Vandermaas in support of Lars Hedegaard, and a call to Europeans to apply Dr. King’s teachings regarding ‘non-violent direct action.’ Published by the International Free Press Society on both the Canadian and international websites along with statement from other researchers, academics and journalists. An account of our campaign to make the Canadian flag legal again in Caledonia. It took 31 months and 4 arrests to force the OPP to protect non-natives’ Freedom of Expression in the face of threats from native militants, but the goal was accomplished on July 12/09. NOTE: Be certain to view the video of the ‘dhimmi’ OPP officers asking if Mark Vandermaas and Merlyn Kinrade would ask permission from the native occupiers to raise a Canadian flag(!). The word ‘dhimmi’ is used here to highlight the similarities between official appeasement of native extremism here in Canada and that of Islamic extremism in Europe. CANACE report written by Gary McHale in August 2011. 27,000 downloads as of Feb 2011. Ontario government showed bias in the extreme when it petitioned Court not to jail native protesters, and offered $200,000 towards legal fees, plus more if an appeal of the convictions is necessary. Gary McHale column in Caledonia’s Regional News on how the McGuinty government is paying protesters who attacked Caledonia. RedWire Magazine provides a blueprint for terror and a manifesto of hate against non-natives – with taxpayers’ money. photos and evidence showing the nexus between Islamic/anti-Israel extremists and Native militants in Caledonia. Councillor Miller denounces the various lawless, ad hoc groups on the Six Nations reserve claiming to speak for Six Nations, saying they are not supported by the people of Six Nations. Miller names the very groups being aided in their lawlessness by the CUPE-led coalition of radical unionists, anarchists, etc. Gary McHale presentation to 2010 New Directions in Aboriginal Policy forum, Mount Royal University, Calgary, sponsored by Dr. Frances Widdowson, Donner Book Prize finalist for Disrobing the Aboriginal Industry. Federally-funded ($1.2M) magazine radicalizes native youth via a blueprint for terror and a manifesto of hate against non-natives. The first major report released by Gary McHale & Mark Vandermaas under the CANACE name in December 2007 that served as the only comprehensive accounting of Caledonia’s suffering until the arrival of Helpless on Oct 27/10. The story of a Caledonia family abandoned by the OPP. The Caledonia Victims Project has the image of a dancer in its logo to honour this brave girl who chose to speak out even though she lived in fear on a street abandoned to native thugs by the OPP – the Sixth Line.Julian Fantino refused Mayor Trainer’s request in 2009 that he meet with people from the Sixth Line, but he always found time to meet with the native militants who terrorized them. Mark Vandermaas’s fully-cited presentation to 2010 New Directions in Aboriginal Policy forum, Mount Royal University, Calgary. Overview of victims of racial policing: OPP intimidation non-native residents & activists; unintended native victims; and the misapplication of the Ipperwash Inquiry recommendations used by the Ontario government to justify its handling of the crisis. Tekawennake News (Six Nations): Two-part op-ed series written by Gary McHale, Mark Vandermaas, Merlyn Kinrade and Doug Fleming as part of a court-approved settlement agreement after a reporter falsely accused us (with help from radical students/unionists from York University/CUPE 3903) of being racist, anti-native neo-Nazis, etc. Part One addresses the false neo-Nazi allegations, Part Two looks to the future. This simple diagram explains our plan to create the conditions required to facilitate healing and reconciliation: truth, justice, apologies. It was presented first to Brantford Council Sept 29/08; to the 2010 New Directions in Aboriginal Policy Forum at Mount Royal University on May 05/10; and to the media at our Feb 23/11 ‘Truth and Reconciliation Rally’ news conference in the Queen’s Park Media Studio. (Ottawa, March 22/11) presentation by Canadian Advocates for Charter Equality (CANACE) and the Caledonia Victims project. Sponsored by Free Thinking Film Society and International Free Press Society. Highly recommended as overview to major policy issues re Caledonia. Stunning letter to Turtle Island News published May 25/11 in which Councillor Miller outlines the lawlessness and social problems facing Six Nations and tells residents to stop blaming non-natives for their problems. See also – VoiceofCanada, July 14/09: ‘The Strength of a Woman’: Six Nations Councillor Helen Miller. Councillor Miller denounces the various lawless, ad hoc groups claiming to speak for Six Nations, saying they are not supported by the people of Six Nations. This article by the Dunnville Chronicle recounts Julian Fantino’s refusal of Haldimand Mayor Marie Trainer’s request that he meet with the “most aggrieved” victims of Sixth Line or Dave Brown/Dana Chatwell. Dramatizes the egregious lack of concern by the OPP leadership for even the most traumatized non-native victims. The Canadian Civil Liberties Association was provided a draft copy of our ‘Human Costs of Illegal Occupations‘ report [PDF, 101p] prior to its release in 2007, but continued to ignore our repeated cries for help on behalf of Caledonia residents, even after the publication of Helpless, and even after criticism of its refusal to help by Christie Blatchford. 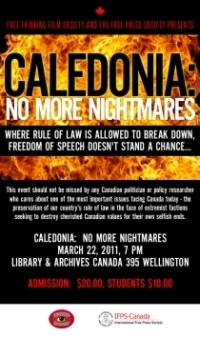 On March 02/11 the CCLA made it clear they had no intention of ever addressing Caledonia’s civil rights abuses. They refused to even grant us the courtesy of a meeting to discuss the issue. Toronto Sun founder Peter Worthington was scathing in his criticism of the CCLA double standard. How could it possibly be that an entire class of citizens were not only abandoned by their government and police during an illegal peacekeeping mission on Canadian soil, but by the very NGO that claims to be a leader in protecting Canadian civil liberties? Would the CCLA have turned two blind eyes to Caledonia victims if they were black or native people who were being terrorized by white racists while police officers stood guard for the perpetrators? Caledonia Victims Project founder Mark Vandermaas, who found Christianity during his work as a rule of law activist, laments the fact that organized religion has turned its collective back to Caledonia’s innocent victims. Excerpt & related resources w/link to perhaps the best commentary yet on academic freedom and free speech on universities since University of Waterloo was intimidated radical students into cancelling Christie Blatchford’s talk on Nov 12/10. In University Protests and Freedom of Speech Dr. Widdowson observes the new ‘religious’ fervour with which students now seek to suppress free speech as she discusses how she and her university stood up against those who mounted a campaign to have Gary McHale and Mark Vandermaas ‘disinvited’ from her 2010 New Directions in Aboriginal Policy forum, held at Mount Royal University, Calgary, May 05/10. Widdowson is co-author of Donner Book Prize finalist Disrobing The Aboriginal Industry. Those concerned with real property sales, mortgages and protection of property rights should be concerned about an OPP officer who is videotaped explaining that the OPP will not protect an innocent property owner because Land Title deeds are not sufficient proof of ownership for law enforcement purposes against illegal occupations. Even though a Superior Court judge would rebuke the OPP for abusing their power and authority in this very situation then-OPP Commissioner Julian Fantino later testified he fully supported the officer’s explanation, and accused Gary McHale of trying to ‘bait’ him by asking the officer to explain why the OPP was refusing to aid the land owner. Authored by Gary McHale & Mark Vandermaas in 2008 under the CANACE banner. Exploded some of the key legal myths spread by OPP and native protesters to ‘justify’ lawlessness such as Colour of Right and Duty to Consult. It also addresses Police Discretion, and the myth that land owners are helpless in the face of police refusal to enforce the law. Since release of this report, a number of court decisions have been handed down and/or discovered which fully validated the (non-lawyer) authors’ conclusions. The first three cases cited below are court decisions made since the Caledonia occupation began in 2006 – all of which clearly state that the recognized representatives of Six Nations have not even made a claim for possession or return of the property, and even if they did, it would not succeed.Judges have observed, however, that Six Nations may well have a financial claim in that they were not paid the amount that was agreed to. This is a joint education project by Canadian Advocates for Charter Equality and the Caledonia Victims Project. This is NOT the publisher’s website for Christie Blatchford’s book HELPLESS, nor is it endorsed by the author. Click here to learn more. MPP Toby Barrett: Is Blatchford’s ‘Helpless’ the final word on Caledonia?